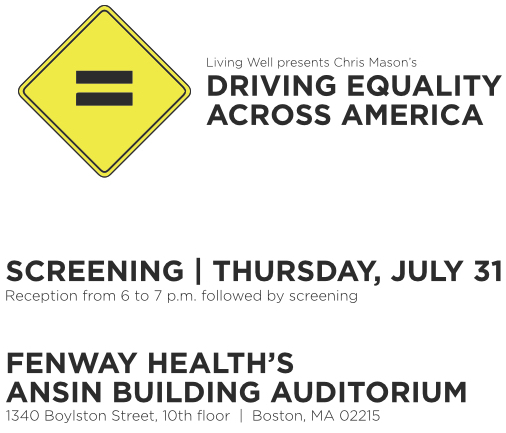 Join us for the World Premiere of Driving Equality Across America at Fenway Health’s 1340 Boylston St. location. We will be showing the film in the beautiful 10th floor auditorium. This event is completely free and all are welcome to attend. Driving Equality Across America is the product of a 107-day, 22,000-mile trek through most of the lower 48 states in an effort to meet, interview, and share the stories of LGBT Americans, their allies, and their opponents. This film follows the filmmaker’s trip across the country as he meets LGBT Americans where they live, in small towns and big cities. Through touching interviews, some heartbreaking, others inspiring, Driving Equality Across America offers a glimpse of the filmmaker’s journey into the heart of LGBT America. In addition to the film screening, the accompanying book, Driving Equality Across America – Posts From The Road, will be available for purchase (cost: $10) and signing. This entry was posted on Sunday, July 20th, 2014 at 9:30 am and is filed under Uncategorized. You can follow any responses to this entry through the RSS 2.0 feed. You can leave a response, or trackback from your own site.